HeyJay Hand Dyed Yarns sell individually dyed knitting and crochet yarns made from the finest of materials. These are dyed using professional acid dyes. Sparkle sock yarns contain 75% superwash merino, 20% nylon and 5% sparkle. The sparkle is woven into the yarn so does not shed and is not itchy to wear - it’s good stuff! Each skein is approximately 100grams/400meters. Price is per single skein. Each hank is slightly different and unique due to the nature of the dyeing process. The yarn will hold up fine in the washing machine although I would recommend a cool wash to maintain the colour vibrance. Please feel free to drop me a line if you would like to discuss a custom order. I accept Paypal, Etsy giftcards or Credit/Debit card payments. If payment is not received within 48 hours the order will be cancelled. I aim to ship within 1-2 business days. UK - Royal Mail, Signed For Second Class: estimated delivery in 3 working days, signature required. Shipping charges are flat rates so there is no extra charge for multiple items. I do my best to package products to sufficiently protect them in their journey to you. If packages are delayed in transit I will do my best to liaise with the shipping provider but please keep in mind it is largely out of my control. I am happy to refund or exchange provided the item is returned in a resaleable condition. I cannot accept yarn that has been wound into a ball. I cannot refund postage, nor can I cover the cost of returns postage. I am happy to arrange custom orders, big or small! Just drop me a line, I love working on special requests. Please note that prices are per single skein. Wholesale is available on request to retailers. 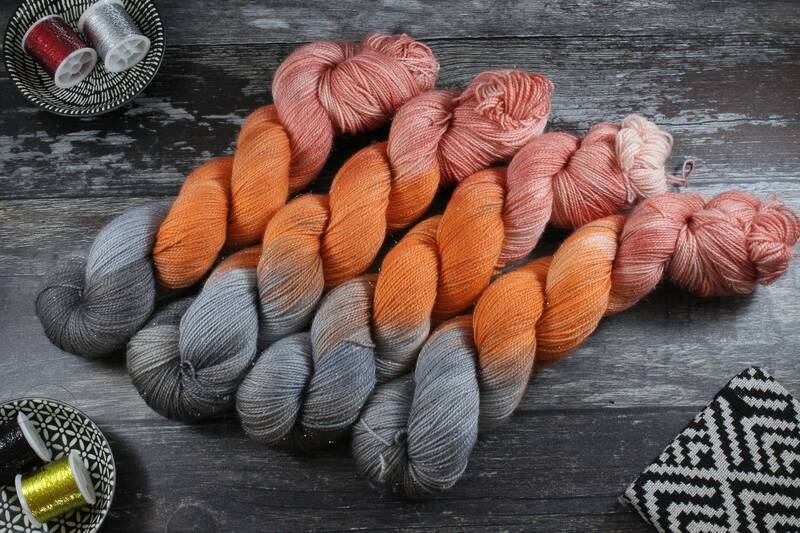 Please note that due to the nature of the dyeing process, it is almost impossible for me to dye skeins and match them to previously purchased skeins. They will almost certainly not be the same and will most likely not match so if you want larger quantities of a colourway, please send me a message and I can dye larger batches together in one sitting for the best possible results. If you need more yarn for a bigger project, purchase the amount you need in one go. I'm always happy to chat and try to be as helpful as possible so feel free to get in touch.